She Dreams in Fiction: Follower Love Giveaway Hop! Greetings, fellow readers! 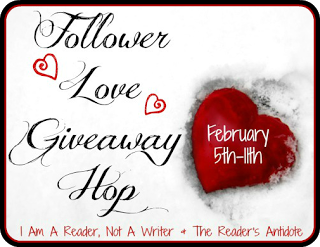 I am happy to announce another international giveaway, the Follower Love Giveaway Hop! This hop is hosted by The Reader's Antidote and I Am A Reader, Not A Writer. I am so grateful for all the wonderful followers I have, so what better to celebrate you guys than give something away? Thanks for sticking with me these last two months. I really love ya'll! As I said earlier, this is an international giveaway (as long as the Book Depository ships to you). I also have news... if She Dreams in Fiction gets over 200 followers before the end of the giveaway, I'll pick TWO winners. That's right. If we get 200 followers, two people will be able to choose one of the above books! I'm really excited about this little bit of awesome. Enter in the Rafflecopter below! EDIT: Wow, you guys! She Dreams in Fiction has officially reached over 200 followers! I don't know what to say... oh my word. Thank you so much! It really is amazing that this little blog is growing so fast. Really, it's completely because of you guys. So! Since we've reached that 200+ mark, you know what that means, right? I'll be choosing two winners when the giveaway ends! Just a little extra thank you for all that you guys do. I'm currently reading Hysteria by Megan Miranda, and Hidden by Marianne Curley :) And Splintered or Scarlet are the most interesting for me. Great book choices! I've already read and loved Splintered, so if I won I'd either pick Paper Valentine (I loved loved loved Brenna Yovanoff's The Replacement! If you haven't read it, I'd really recommend it :) ) or Just One Day. I'm reading Dance of Shadows at the moment. I think Scarlet will be my choice:). Thank you for the giveaway! I'm interested in Splintered the most, but they all look good. Recently, I've enjoyed The Darkest Minds. Thanks for the giveaway. I'd really like to read "Just One Day" by Foreman. Looks really good and I've heard so many great things about it! I recommend for you to read The Tiger Saga by Colleen Houck. Thanks for the gveaway! I recommend reading Tell the Wolves I'm Home. I'd like Prodigy -- I read Legend and was quite surprised I liked it as much as i did! I am most interested in Shades of Earth. That's because I have read the other books in the series and want to find out what happens when they land on the planet. Thanks for the giveaway! I am interested in Splintered, the Alice in Wonderland spinoff sounds interesting. I'm really looking forward to The Prey by Fukuda. I read The Hunt and couldn't believe I had to wait for the 3nd book to see what happens! Thank you for the giveaway!! I haven't read Scarlet yet but I really want to! Splintered and Prodigy were both really really great, definitely worth a read. And the cover for Paper Valentines is really intriguing. Great choice of books!! thx u for the great giveaway..
paper valentine, mainly because the cover art is really cool! I'm currently reading Gone Girl. I really want to read Just One Day and Prodigy! I recommend you the Leviathan trilogy by Scott Westerfeld. I loved it! Based on teh list, definitely Shades of Earth because I have the first 2 books! I NEED to read Scarlet! And I just finished Splintered. So good! I can't wait to read Splintered. I am a huge fan of Alice in Wonderland and this sounds so interesting. Also Shades of Earth and Paper Valentine both look good. I am reading Grave Mercy right now. I loved Die for Me and Until I Die by Amy Plum. I would pick Shades of Earth.I recommed Sea of Tranquility by Katja Millay. Thanks! I recommend Drowning Instinct by Ilsa J. Bick, it was simply AMAZING. Thank you!! I'm currently reading My Soul to Keep by Rachel Vincent, and The evolution of Mara Dyer by Michelle Hodkin :) And Prodigy, Just One Day or Scarlet are the most interesting for me. I would love to win Just One Day. I would pick Paper Valentine. I am not in the middle of reading any book but I would love to try another historical western romance coz I have been hooked with it these past few weeks. And I would highly recommend Texas Destiny!! I'm currently reading Ever After by Kim Harrison. If I was lucky enough as to win, I would want to read either Splintered or Prodigy. Thank you for the wonderful giveaway! I'm reading Lichgates by S.M Boyce. It's awesome. I like fantasy or paranormal. I'm currently reading Embrace by Megan Derr, and though I want to strangle a couple of the characters, it's really good! I am currently reading Unravel Me and Nobody But Us. Thank you for the giveaway! I'm reading Mesmerized by Julia Crane - waiting on Indigo Spell! That series is amazing! So is Vampire Academy. Favorite series is definitely the Great And Terrible Beauty series by Libba Bray. I'd love to have Splintered. Thanks for holding this giveaway! Which book are you most interested in? Any awesome book recommendations? What are you currently reading? Please help me keep your privacy and do NOT share your email in the comments. I would love to get Splintered, it sounds really interesting! I'm currently reading Angel Fire. I would probably go with Scarlet since I still have gotten to read that. I'm currently re-reading some adult paranormals. Thank you so much for the giveaway. I am really excited to read Just One Day. I want to read Scarlet also. I can't wait to read Scarlet! Thanks for this amazing giveaway - I would love to win! I'm currently reading How to Save a Life by Sara Zarr. I'm not really sure which book I'd choose either Scarlet, Just One Day or Splintered! I'm most interested in Splintered and Just One Day! I'm interested to read Just One Day.I'm currently reading Probability of love at a first sight. I'm currently reading Don't Fear The Reaper by Michelle Muto and loving it!! I'm most interested in Shades of Earth. I recommend The Hunger Games trilogy, Nation by Terry Pratchett and Rachel Aaron's Eli Monpress series. I'm reading both Beautiful Creatures, and Jane Was Here. I would LOVE to win Prodigy because I want to read it so bad!! Thanks! I just finished reading Dare You To by Katie McGarry and I absolutely loved it. You have no idea how good that book was so for now it's one of my favorites.. So for a book recommendation you could try Pushing the limits and Dare you To(when it comes out). I would love to read the book "Shades of Earth." I just finished reading the book "Prodigy". My favorite books are Easy by Tammara Webber and the Soul Screamers series by Rachel Vincent. "Murder on the Orient Express" by Agatha Christie. I'm sooo curious about Splintered! I'm reading now the amazing Night circus! I am super excited to read Splintered. Just finished Everneath and really enjoyed it! I'd choose either Scarlet or Shades of Earth. They seem the most interesting to me. Thanks for the giveaway! Splintered sounds great. I'm not reading anything right now. I`d love to win Splintered! I would choose Paper Valentine. :) Right now I'm reading Cinder and The Road. I'm really interested in Paper Valentine. It's been on my TBR list for a long time. Thank you! I really want to win Paper Valentine, the cover is amazing and it sounds like a good read. I am also looking forward to reading Scarlet. I have that and Cinder next on my TBR pile. I am currently (finally) reading Insurgent. I'm interested in Scarlett and Splintered :D Thanks for the giveaway! I actually have all of them on my wishlist! I want to read Scarlet! I would probably pick Splintered. Right now I am almost finished with Unravel Me. Im reading The Hobbit right now! I'd love to read Just One Day. I'm currently reading Scarlet. Thank you! I'm currently reading Beautiful Creatures and as I'm almost finished I would love to get Beautiful Darkness. Other books on my wish list include Daughter of Smoke and Bone, Throne of Glass, Cinder, Fever, and Mystic City. I'm looking forward to Paper Valentine and Just One Day - I'ave heard so many great things about both of them. I recently finished Scarlet and can't recommend it, or the series, enough. -I'm most interested in Splintered by A.G. Howard. -Currently reading Beautiful Creatures by Kami Garcia & Margaret Stohl and I have to say I have enjoyed it thus far. I'm currently reading Harry Potter and the globet of fire, since HP is "over" i decided re-read all the series, and also because i've notice that i remember more the movies than the books. I recommed you to read Everneath just in case you still haven´t! Not sure what I most want, maybe Scarlet? And I recommend the Fault in Our Stars! Oh, I can't wait to read Scarlet. Thanks for the giveaway! I'd like to read "Fighting to Survive" by R. Frater. I want to read all of them. :) Especially Scarlet. Oh tough choice between Scarlet and Just One Day! Thanks for the chance at this great giveaway!! I'm most interested in scarlet! I am currently reading Under the Never Sky by Veronica Rossi. I finished Prodigy a few hours ago. Absolutely fantastic! And I read Scarlet last December. Again. fantastic. I love LUX series by Jennifer Armentrout. Recently I'm reading Easy by Tammara Webber. So curious about the book. Right now I'm in the middle of reading three books: Nightshade, Kushiel's Scion, and The Dragon's Tooth.